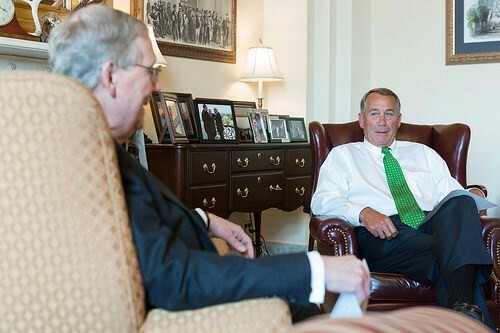 Senator Majority Leader Mitch McConnell (R-Ky.) meets with soon to be former Speaker John Boehner (R-Ohio). Photo via Boehner’s Flickr. House Speaker John Boehner’s shock resignation last week may lessen the chance of a government shutdown, some observers suggest. On Monday, the U.S. Senate passed a temporary budget measure, sending it over to the U.S. House, where debate is expected to be underway on Tuesday. Some conservative Republicans are looking to de-fund Planned Parenthood, the women’s health group involved in a controversy surrounding the alleged sale of fetal tissue to researchers. The fiscal year ends Wednesday, and without at least a temporary budget signed by the President, all government agencies will need to create contingency plans that will affect local residents, businesses and economies. Here are some money angles you can explore if the Republicans and Democrats can’t get a bill to President Obama’s desk. October is a peak month for autumn tourism, according to the National Parks Foundation, but all 401 national parks will be closed if the government shuts down. More than 700,000 tourists could be affected, the NPF reports. The National Parks Service estimated that the 2013 shutdown led to a loss of more than $500 million in tourism spending. Local businesses that rely on these tourists will also be affected. Talk with hotels, restaurants and retail shops near national parks. Have they experienced cancellations or a lull in businesses? Do they expect to? U.S. Department of Agriculture officials have said the department does not have the reserves to cover Supplemental Nutrition Aid Program for any period after Oct. 1 if the government shuts down. In the 2013 showdown, the USDA was able to provide food stamps to 47 millions of Americans who rely on SNAP. How do residents in your community who rely on SNAP plan to cope without food stamps? Are other charitable agencies preparing for a growth in clients? If the government were to shut down, each federal agency must decide who is still expected to come to work, and who will be forced to take a furlough day. In the 2013 government shutdown, more than 800,000 federal workers were told not to come to work during a shutdown. Congress voted to pay those furloughed workers back pay (even though they couldn’t work), but there is no guarantee this time around. The White House reported federal furloughed employees received $2 billion in back pay in 2013 for work they were unable to perform. Even workers who do have to work still won’t receive a paycheck until a budget is passed. Security workers, for instance, are expected to work during the shutdown, so air travel will be unaffected, according to the U.S. Office of Personal Management. The 2013 shutdown led to more than 10,000 stop work orders for businesses who do contract work with the federal government, resulting in payment delays for work they had already performed and temporary layoffs, according to a report from the White House. Businesses that don’t contract with the government aren’t out of the woods either. In October 2013, the Small Business Administration couldn’t process some 700 applications for $140 million in small business loans. How are local businesses responding to the talks of a shutdown? Were any businesses in your community affected by the 2013 shutdown? Are they developing contingency plans? If the government shuts down, Veterans Affairs officials report that nearly all VA hospitals and clinics would be affected. Department staffers could face immediate furloughs. If it’s anything like 2013, mostly administrative staff would be furloughed, so VA benefits checks could be backlogged or even stopped as there isn’t enough cash to pay November benefits, according to the VA. How are local VA hospitals and offices prepping for a shutdown? Are there veterans who are more vulnerable than others? Talk with veterans about their concerns. Politics And Money: The $4B Presidential Campaign? Politics And Money: Who’s Really Behind That Ad?